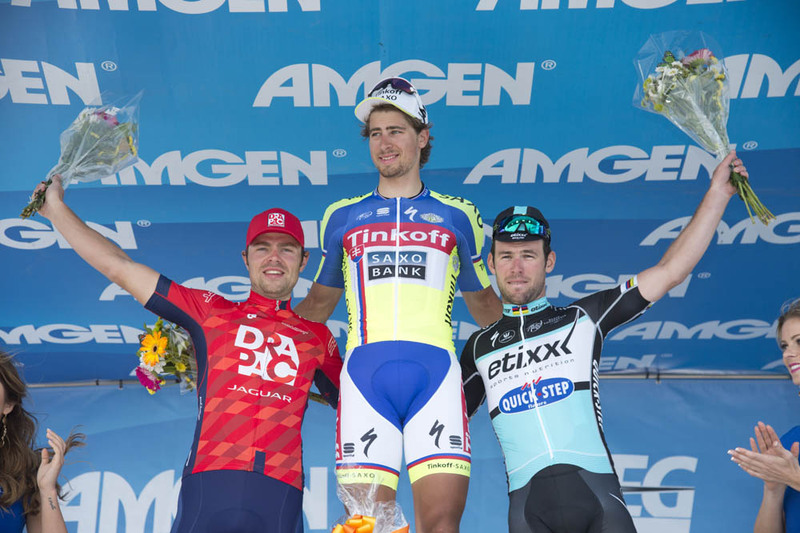 Peter Sagan (Tinkoff-Saxo) won stage four of the 2015 Amgen Tour of California at Avila Beach on Wednesday. The Slovak national champion’s win crowned a great day for the Tinkoff-Saxo team after Alberto Contador took the race lead in the Giro d’Italia. Wouter Wippert (Drapac) took second place, with double 2015 stage winner Mark Cavendish (Etixx-QuickStep) in third. It’s Sagan’s second victory of the season, after he won a stage of Tirreno-Adriatico, and his 12th stage win in California, having claimed at least one stage victory in every edition of the race since 2010. Stage three winner Toms Skujins (Hincapie Racing Team) maintained his race lead ahead of Sagan by 32 seconds. Canadian Rob Britton (SmartStop) is third at 43 seconds. 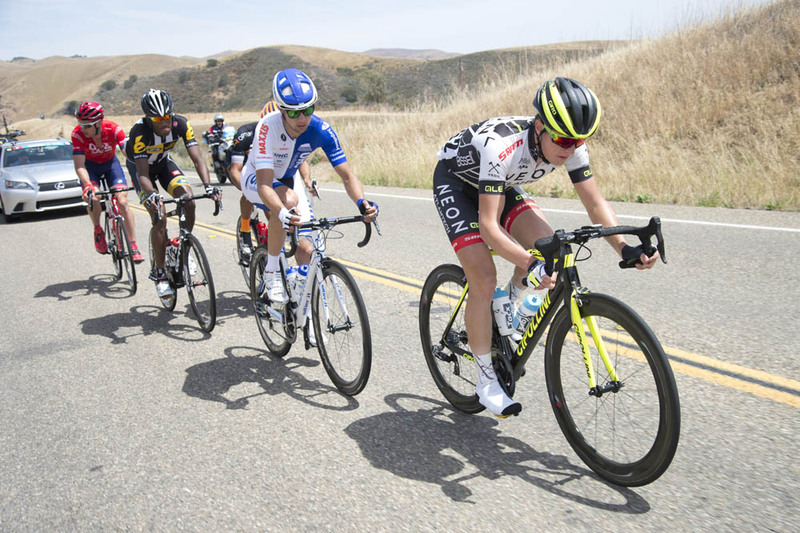 After a flurry of early attacks and catches in the opening kilometres, the day’s escape group settled out to consist of Jesse Anthony (Axeon), William Clarke (Drapac), Gregory Daniel (Optum), Kiel Reijnen (UnitedHealthcare) and Daniel Teklehaimanot (MTN-Qhubeka). The five riders were kept closely at hand by the peloton, with their gap wavering around two or three minutes for the majority of the stage. The Hincapie team of Skujins shared chasing duties with riders from a selection of other teams not represented in the break, notably Etixx-QuickStep. With 30km to go, the gap was down to half a minute – too early for the peloton to make the catch with the danger of a new and fresher escape making a danger move and spoiling the sprinters’ chances of a stage win, just like Jens Voigt did on a similar stage to Avila Beach in 2013. Sensing a last-ditch opportunity for glory, Clarke and Daniel split away from the other three in the escape, with Daniel then going solo as Clarke’s day in the break took its toll on his legs. Daniel put himself into a tuck position and time trialled his way forward, opening the gap back out to over a minute. On a windy day, Daniel simply couldn’t out-gun the peloton and the American was inevitably caught with 15km to go. Just as he was, Tinkoff-Saxo suddenly went to the front of the bunch and Sagan briefly gapped the bunch with King of the Mountains jersey holder and serial attacker Daniel Oss (BMC). Etixx once again brought that move to heel. As the race reached the final 5km, a succession of teams fought for position at the front of the bunch, with Giant-Alpecin, Trek and Tinkoff-Saxo mixing up with Etixx. Oss again sprung an attack through the twisting final kilometre as the sprint trains were disrupted, but Sagan put in a big turn of speed to catch him just before the line. This time, Cavendish couldn’t match Sagan’s pace, or that of Wippert. 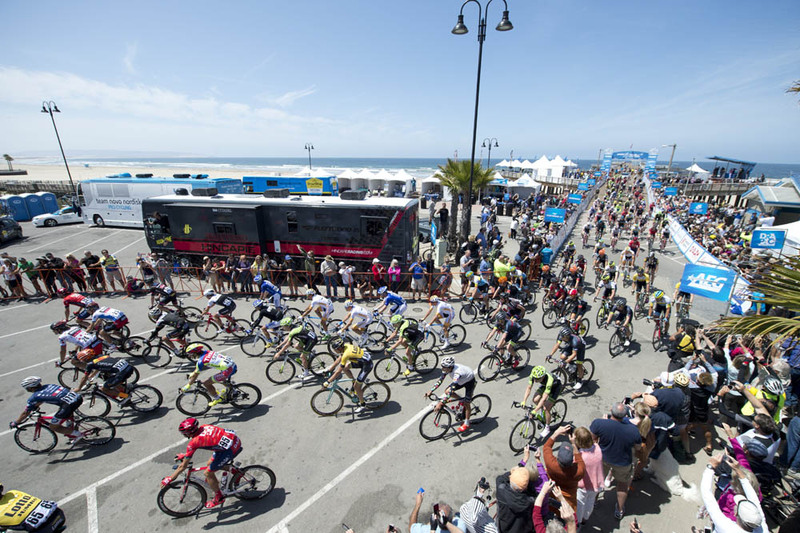 The 2015 Amgen Tour of California continues on Thursday with stage five, a lumpy excursion from Santa Barbara to Santa Clarita over 154km before Friday’s key 24km individual time trial at Big Bear Lake which may be affected by snowfall. The race concludes on Sunday.